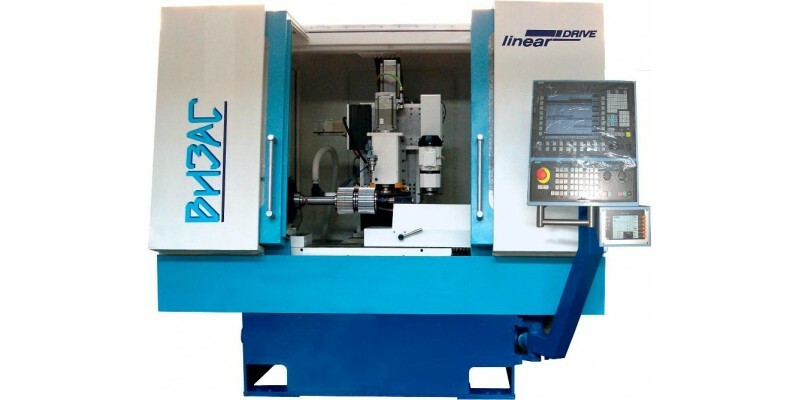 Semiautomatic VZ-676F4 gear grinding machine with CNC for profile grinding of helical gears and spur gears with external grasping by abrasive grinding wheel with cooling. Grinding of gears is carried out by the method of profile grinding (method of copying). 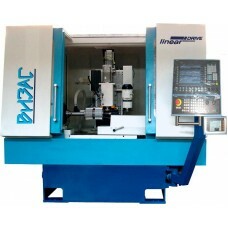 The semiautomatic machine is made in a horizontal configuration. The base serves as the base on which the basic semiautomatic assembly units are assembled, which are designed as separate units, which facilitates their assembly and disassembly during repair (transportation). 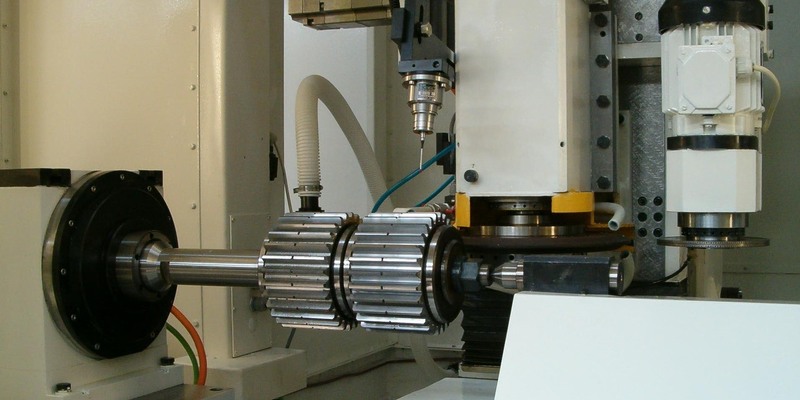 On the frame in front there is a table, movable in the longitudinal direction, on which is installed the headstock of the workpiece with the workpiece being processed and the hydroficated tailstock. In the rear part of the frame there is a transverse carriage, on which 2/5 the reducer of rotation of the vertical support is mounted. On the spindle of the rotation reducer, which rotates around the horizontal axis, a vertical support is attached. On the moving carriage of the support there is a grinding grinder and an orientation device. On the basis of the vertical support, the carriage of the straightening mechanism is mounted, on which the straightening mechanism is mounted with a diamond roller. This arrangement of the straightening mechanism ensures high efficiency of the straightening process (accuracy and productivity). The working area is completely enclosed by a cabinet-type enclosure with sliding and mounting doors. Inside the fence there is a lamp for lighting the working area. The cabinet of the electroautomatics with the heat exchanger is installed in a convenient place for servicing. The control panel can be moved to an operator-friendly location. Behind the machine there is a coolant supply and cleaning system and a hydrostation. 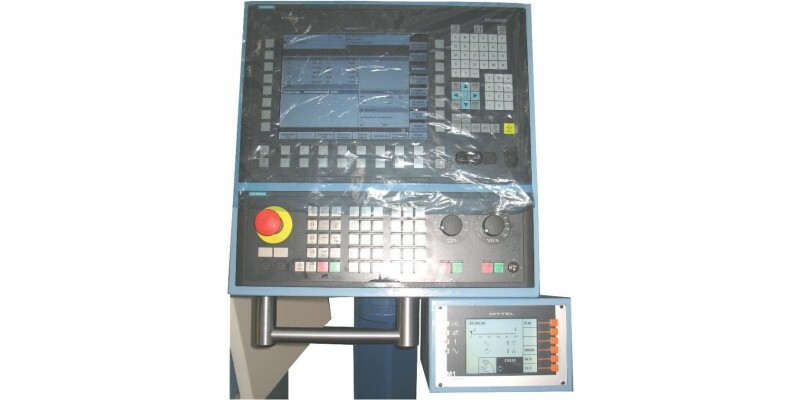 The list of control elements of the CNC Unit, their purpose and principle of operation are given in VZ-676F4,00,000RE1, as well as in the technical documentation for the product. The spindle rotates from the built-in circular high-torque synchronous motor. The sensor for measuring the angle of rotation is mounted directly on the spindle. The spindle is mounted on a special precision thrust radial bearing. The constructive device of the headstock of the product ensures the highest accuracy of rotation, reliability and durability. Moves are carried out from the linear synchronous electric motor through closed with a pre-tension rolling guide with an integrated measuring system in them. This design provides simple installation, exceptional dynamics and high accuracy of movement, high wear resistance of the drive due to non-contact force transfer. Moving at high speeds greatly reduces the time of installation movements. produces the final measurement of the treated gear by some parameters (circumferential tooth pitch, accumulated tooth pitch error, tooth direction. The system of preparation of control programs (SPM) is implemented on the basis of a personal computer, which is part of the CNC semi-automatic machine. The start button of the SPM is built into the standard Sinumerik interface. All actions when working with SPM are carried out with the help of controls (keyboard, mouse) built into the operator panel. The program has a friendly intuitive interface. For the compilation of the control program, there is no need for in-depth knowledge of the CNCU programming language, as well as knowledge of the theory of helical surfaces. Creating a control program for the processing of a particular type of part occurs automatically. The input data for the calculation is entered in accordance with the drawing of the part. For this, the graphic forms corresponding to the fragments of the drawing are filled. 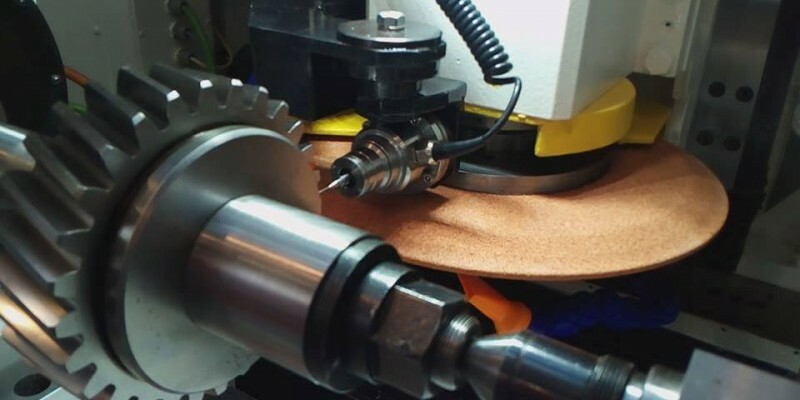 In addition, geometric parameters of the grinding wheels are introduced, which will be processed and process data. After entering the initial data, a mathematical simulation of the grinding process is performed. 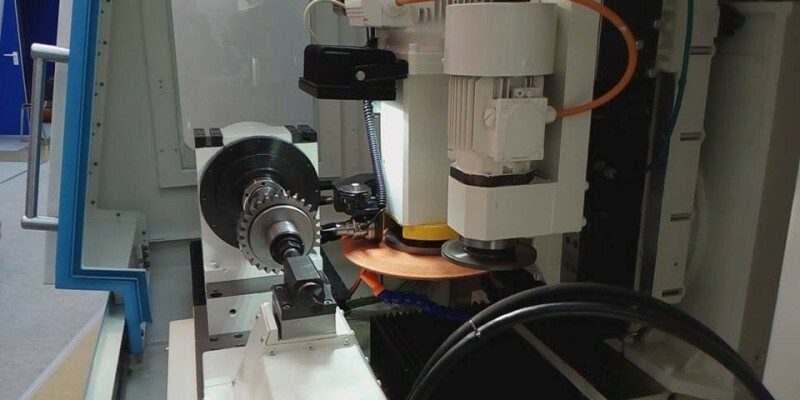 Then, the adjustment and trajectory of the motion of the wheel relative to the workpiece are automatically selected in such a way that all the required parameters are maintained. After all the necessary calculations have been completed, the control program for processing the selected part is automatically generated and transferred to the CNC of the semi-automatic machine after pressing the corresponding button in the PDS.